البحث عن United Nation’s Global Climate Action Award is on! Applications are being accepted from 11 فبراير من خلال 30 أبريل 2019. 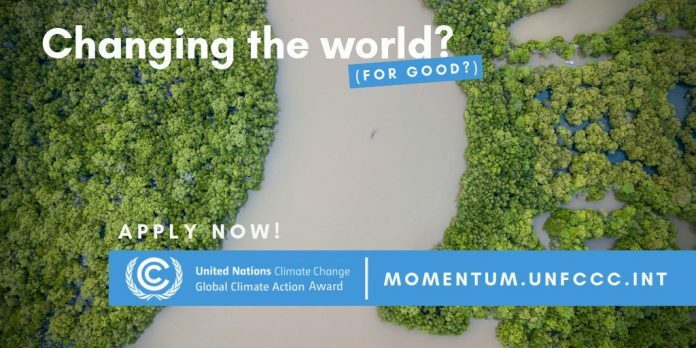 Spearheaded by UN Climate Change’s Momentum for Change initiative, the UN Global Climate Action Award يسلط الضوء على الأمثلة الأكثر ابتكارًا وقابلية للتكرار والتكرار لما يفعله الناس في جميع أنحاء العالم للتصدي لتغير المناخ. إذا نجحت مؤسستك في تنفيذ مشروع أو مبادرة أو برنامج أو نشاط آخر يتناول التخفيف من حدة تغير المناخ أو التكيف معه مع التركيز على أحد المجالات الأربعة المبينة أدناه ، فإننا نود أن نسمع عن ذلك. محايدة المناخ الآن ، recognizing efforts by individuals, companies and governments that are achieving real results in transitioning to climate neutrality. لبدء تطبيق جديد ، التسجيل في بوابة تطبيق الإنترنت الخاصة بنا. It will take at least an hour to complete an application. You can save your progress at any time and work on it at your convenience. Completed applications must be submitted by midnight GMT on 30 أبريل 2019. يرجى زيارة معلومات أساسية page for essential eligibility information about the application process. Take a 7-minute tour of the application process. Watch the screencast للحصول على إرشادات خطوة بخطوة.